Telengard: One of the earliest CRPGs for home computers.I recently had the great pleasure of interviewing Daniel Lawrence, a pioneer in the CRPG industry who started off writing CRPGs for mainframes. 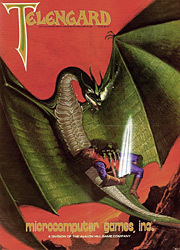 Perhaps his most famous CRPG is Telengard, which was one of the earliest (if not the earliest) game of its type for early platforms such as the Commodore PET, Atari 800, and TRS-80. It features "procedurally generated dungeons" so that no two games are exactly alike, and is set in real-time. Indeed, in many ways it's an early Diablo! In the interview below, I talk to Daniel about these early games and more general questions about what a good CRPG should be. The interview really helped me straighten out some important details about this historic game's development. Enjoy!